On our monthly outing last week part of the group got out of the bus and walked into a meadow to marvel at the glorious blooming wildflowers and to hear guide Dudu explain. Everything was so green and wet from the blessedly rainy winter Israel is finally having! This was at Ramot Menashe, the plateau between the Carmel mountain range and the Jezreel Valley, toward the country's north. GREEN is the topic for City Daily Photo bloggers theme day. Take a look. Bloggers in other countries may take green fields for granted, but Israelis get really excited to see this temporary color in winter, before the long hot dry season turns things brown. You know you're not in Israel when the only potential danger from above is a BUTCHER BIRD attack! I saw this sign while walking my granddog in our leafy northern suburb of Sydney; I didn't know whether to laugh or run! Called butchers because they hang their meat: "Grey Butcherbirds are aggressive predators. They prey on small animals, including birds, lizards and insects .... Uneaten food may be stored in the fork or a branch or impaled." and "Butcherbirds get their name from their habit of hanging captured prey on a hook or in a tree fork, or crevice. This 'larder' is used to support the victim while it is being eaten, to store several victims or to attract mates." Another source says "With its lovely, lilting song, the Grey Butcherbird may not seem to be a particularly intimidating species. However, with its strong, hooked beak and its fierce stare, the Grey Butcherbird is not a bird to be messed with. When a nest or newly fledged chick is around, if you venture too close, a butcherbird will swoop by flying straight at your face, sometimes striking with enough force to draw blood, and each swoop is accompanied by a loud, maniacal cackle. "Another source says "With its lovely, lilting song, the Grey Butcherbird may not seem to be a particularly intimidating species. However, with its strong, hooked beak and its fierce stare, the Grey Butcherbird is not a bird to be messed with. When a nest or newly fledged chick is around, if you venture too close, a butcherbird will swoop by flying straight at your face, sometimes striking with enough force to draw blood, and each swoop is accompanied by a loud, maniacal cackle." You know you're not in Israel when your Jewish grandson comes home with a Christmas wreath. :) Eyal's 5th grade class here in Australia made wreaths this December. From coat hangers and cut up garbage bags! Eyal chose fragrant yellow ones for his wreath. Libby and Billy the Cavoodle enjoyed having their first-ever wreath. Merry Christmas to all our Christian friends! Happy 8th and last night of Chanuka! Grandkids Eyal and Libby lit the eight candles. I am spending a few months with my daughter, son-in-law, and three grandchildren down in Australia, in their home just north of Sydney. Whether you are doing Chanuka or Advent right now, I wish you all a happy holiday season. I was happy to vote today! Israel had municipal elections and it was a yom shabbaton, a day off from work and school. Two of our town's schools had polling places for the roughly 6,500 residents old enough to vote. It was a festive atmosphere in Meitar, with folks walking in, stopping to chat, and smiling at one another. And music and booths just outside the schools' gates. It happens every five years. Quite some time ago our town's Chabad rabbi gave me this pushke. Rabbi Shneor's hope was that I would put in some loose change every day--not because he needed the money for Chabad House, but because he wanted me to learn the habit of giving tsdakah every day. Tsdakah in Hebrew means justice or righteousness but is often translated (for want of a better English equivalent) as "charity." Just before I shut down the computer for the next 26 hours of Yom Kippur, let me wish you a gmar chatima tova. May you be written and sealed in God's Book of Life for a good new year of life! Fun at the big annual AACI Association of Americans and Canadians in Israel picnic at a Beer Sheva park. May the year that begins today, 5779 AM (Anno Mundi, "since the creation of the world"), be a good and sweet one for you. Tradition calls for dipping apple slices in honey at the Rosh Hashanah dinner table. Yesterday a friend gave me this strange gift--an Eiffel Tower full of honey made by the bees of Kfar Chabad in Israel! Torah was given to teach us. And today's City Daily Photo Theme Day's focus is TEACH. Rabbi Elazar ben Shamua taught: "The dignity of your students should be as precious to you as your own. The dignity of your colleagues should be as precious to you as your reverence for your teacher. The reverence for your teacher should be as great as your reverence for God." as you have blessed and strengthened your student. Good luck to the 2,310,000 pupils in Israel who start the new school year tomorrow, Sunday, Sept. 2. And blessings to their teachers! These sheep are most likely on the table now during this week of Id il Adha, the Muslim Festival of Sacrifice. We saw them in April crossing a road just northwest of my town in the Negev. A friend and I were driving home parallel to the security wall. On the other side is the West Bank. Id mubarak, wishing a blessed and happy holiday to the Palestinians across the way and to our Bedouin neighbors here in the Negev. Brand new, still partly wrapped additions to the Domino's fleet in Beer Sheva! Soon they will get their blue boxes mounted on the back to keep your pizza hot en route. Don't you love to watch guys tearing down the old ads and putting up new ones?! I almost never pay attention to billboards (maybe because I never buy or need anything), but I do enjoy observing the low-tech old-fashioned work that goes into them. Even if we consider roadside billboards like this one in Beer Sheva to be "visual pollution" we can still appreciate the men who work on tall ladders in the hot desert sun to keep them maintained and up-to-date. And yes, Israel does have many digital billboards, but they lack this human touch. Happy International Cat Day to this wary one-eared long-tailed cat. I locked glances with him outside a Beer Sheva restaurant. Dear readers, I'm sorry for the long time since my last post. Guess it was a combination of sudden busy-ness, procrastination, long hot summer laziness, and bloggers block. I'll try to do better now. SPIRIT is the City Daily Photo group's theme day topic. 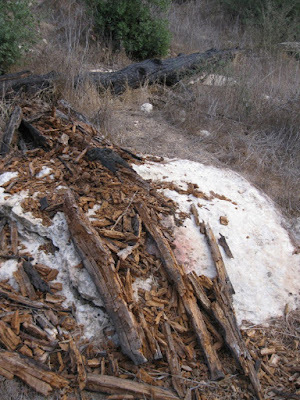 This disintegrating trunk of a burnt tree on a white boulder reminds me, in a reverse sort of way, what I read years ago concerning the Great Spirit. You know, if you take all your books, lay them out under the sun, and let the snow and rain and insects work on them for a while, there will be nothing left. But the Great Spirit has provided you and me with an opportunity for study in nature's university, the forests, the rivers, the mountains, and the animals which include us. Roses planted in a vineyard?? If you are from rural Italy or France or California you probably know about this tradition. But it was news to me when our tour guide pointed it out on June 12, just as the scene was quickly disappearing from the bus window. We were traveling through the Jerusalem Hills, west of Jerusalem. He explained the roses as an early warning system. Roses are more susceptible to the same type of fungal disease (e.g. powdery mildew and downy mildew) than the grapevine. So if there are signs of trouble on the roses the farmer knows that action needs to be taken soon or the grapevines will be infected next. Another reason I have heard is that in addition to being a ‘canary’ when the vines were worked with draft horses or oxen, roses encouraged them to turn properly at the end of the rows because of their thorns, ensuring that the working animals weren’t tempted to cut a corner and damage the last vine. Some time ago in the Hunter Valley in New South Wales I quizzed one of the “old timers” in the area about the same issue. His response left me wondering whether or not he was “having a lend of me”.In the early days of grape growing, before any mechanisation, the vineyard work was completed using horses and horse pulled equipment. The best source of strong “draught horses” were the local coalmines where any pulling work involved horses.Sadly the distance underground was so far that the horses used were stabled in areas deep underground and, while they were very well cared for, their eyesight eventually became a casualty of the environment. The period horses were kept underground was mercifully short but permanent damage to their vision occurred. As the horses were “traded out” the local farmers and grape growers sought to utilise their great strength and stamina, particularly working with ploughs in vineyards where the rows were quite narrow. Now the reason for the roses at the ends of the rows, as explained by this particular veteran, was to let the ‘blind’ horses know when they reached the end and it was time to turn. Roses in the Hunter Valley constantly bloom almost all year. I was never able to convince myself either way with his story; Australians can be very straight-faced when “spinning a yarn”. I will leave it up to you to decide." UPDATE: See more in the Comments section about the "pit ponies," the horses, mules, and ponies which worked in the dark coal mines of many countries for more than two centuries. Last week's farm pictures from the middle of Israel. They are snapped through the window of a bus, so it's better if you click a few times and open them to the large version. You can see the sharp line dividing dark soil from green plants. According to the hats, I reckon those are workers from Thailand harvesting whatever crop that is. And here a truck with trailer goes along the farm road leaving a trail of dust. Israel is in her fifth year of drought. Most of our water now comes from desalination. UPDATE: I just learned that today is World Day to Combat Desertification and Drought! I got to participate in a lovely iftar this week, my first! No, it wasn't in this big Bedouin hospitality tent, but it WAS in the courtyard of the new buildings next to it. It was at Project Wadi Attir, a new and growing Bedouin + Jewish sustainability initiative in the Negev desert. If you enlarge this photo all the way, you can see the modern and clean sheep and goat shed. One of their ways to have income is to make and sell cheese. Traditional Bedouin medicinal herbs and cosmetics are another. Here is the courtyard where we assembled and later, at sundown, ate. The iftar was in collaboration with Women Wage Peace, a multi-faith non-political movement formed by women in the aftermath of the big 2014 conflict with Gaza. They arranged a panel discussion by a Muslim of Wadi Attir, a Polish Catholic priest from Beer Sheva, and a woman rabbi, who presented the different attitudes and approaches to religious fasting. 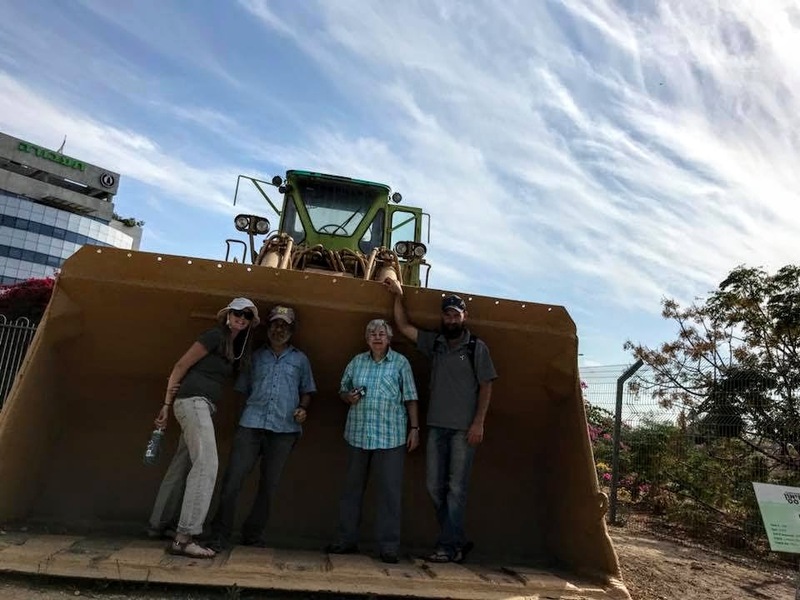 On the right: "Ghadir Hani, formerly our Executive Secretary, has begun working with Ali in the Field Crops department, managing outreach and sales, and helping with special programs. In addition to farmer's markets, Ghadir has also been introducing the products to new markets through word-of-mouth marketing events in people's homes in nearby neighborhoods like Omer, and has been a fixture at special local events..." quoted from the April newsletter. The man wearing a kipa is my town Meitar's mayor; he also spoke, as did the mayor of our neighboring Bedouin town, Hura. While the adults heard the talks, the Bedouin kids and their young Jewish guests made squares for a peace quilt out in the tent. On June 6th, Unity Day, we will spread out 150 quilts which were sewn from thousands of Pieces for Peace which we received from all over the world; we will then create a human chain of unity, and will express our common longing for peace; later Yael Decklebaum will join us at the tent and will sing her songs and talk about her journeys to peace; we will sing the Prayer of the Mothers with her. After all was said and done, the sun set and we hastened outside to the waiting tables full of good food (some prepared by the hosts and some brought by us guests). The Muslims dug in without hesitation. They had been fasting from food AND water from before 4:00 a.m. until 7:47 p.m.! I can't imagine having that kind of self-discipline and devotion for the entire month of Ramadan, which often falls during our very hot summer. Here is a nice explanation from "What You Should Know Before Attending Your First Iftar." The fast itself is considered a purification of sins and a time to cleanse mind, body, and soul. Feeding a fasting person is believed to come with great reward from God and therefore many individuals, organizations, mosques, and community centers will offer an Iftar gathering in which the breaking of the fast is celebrated. It's usually not a ceremonial affair, although at many community gatherings this is often seen as an opportunity to educate and create an inter-faith gathering with delicious food, friends, and conversation. Yesterday I traveled northward an hour and a quarter by bus. Getting off the bus, I stood on the corner for a few minutes marveling at how different Jerusalem is compared to the Negev. There was Calatrava's graceful Bridge of Strings which I watched being built since the mid-2000s. I turned to my right and this huge banner gave me a jolt; like, "Dina, we're not in Beer Sheva anymore!" In not-very-religious Beer Sheva you see many different groupings (Ethiopian Jews, Russian immigrants, Bedouin, etc. ), but ultra-orthodox Jews are few and far between. In the photo is Rabbi Mordechai Eliyahu who was the Sephardic Chief Rabbi of Israel 1983-93 and died on June 7, 2010. The banner calls people to attend a "hilulat Maran," a celebration of his life on the anniversary of his death at his tomb in Jerusalem. To learn about the Aramaic honorific title "maran" for highly respected rabbis, see Wiki. Woohoo, I got to climb up a huge ladder and play in a HUGE truck! What a fun day that was in Ramla! Standing under it is Dani, the man responsible for Kibbutz Gezer Olives. On our day off, Dani took us volunteers and WWOOFers on a tour of the city of Ramla, including this new museum for old vehicles. Ashlea, Dani, Dina, Luke -- what a team! There are lots more posts about our olive harvesting adventures last autumn. For June 1 theme day, City Daily Photos bloggers are posting on the subject ME. It's a rare chance to see photos of the photographers themselves. Take a look!